The perfect Gluten Free Hamburger Buns recipe! You’ll love how simple this paleo bread recipe is to make. Just a few ingredients, and only about 5 minutes to get ready for the oven. 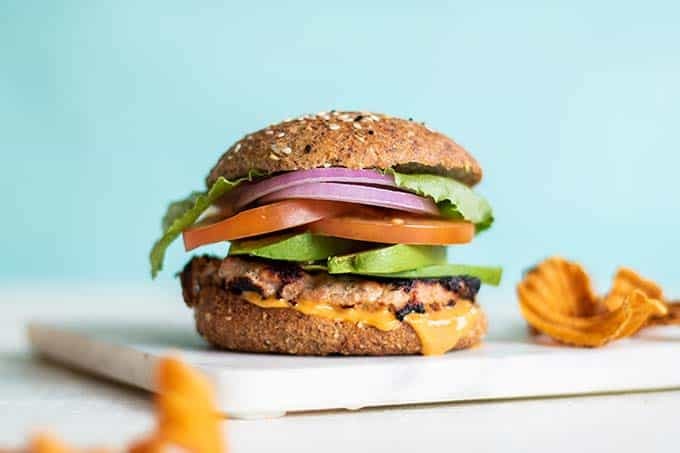 These paleo hamburger buns are keto friendly, and perfect for a variety of diets. The best part — they have a very similar texture to wheat buns, and aren’t crumbly or dense at all! Recently I bought gluten free hamburger buns at the grocery store. Not only did it take me a week and 4 grocery store to find them (apparently they sell out during peak grilling season! ), but they are very “meh.” Yes, they were gluten free, but they were nothing special, and really, I’d rather wrap my burger in a piece of lettuce than buy them again. I remembered seeing a gluten free bread recipe a while back that used psyllium husk, and thought it was time to dive in and try it. 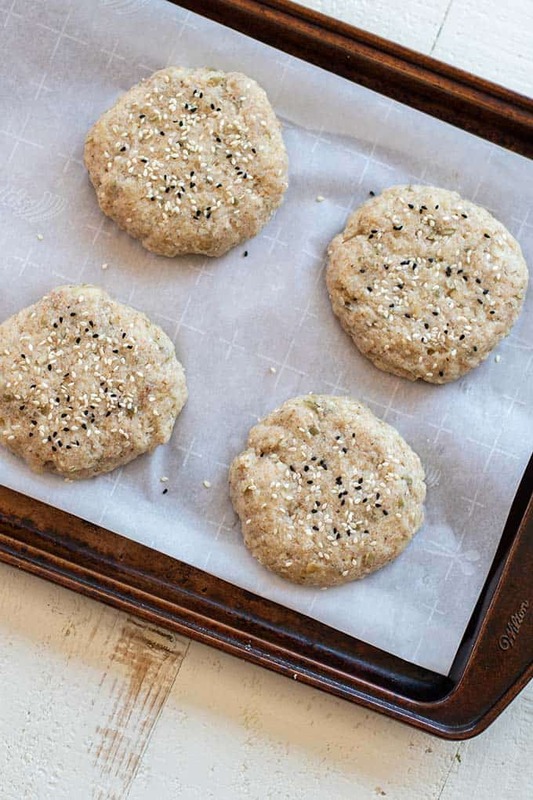 The simplicity of this recipe will draw you in — these homemade gluten free hamburger buns only take about 5 minutes to make and get ready to bake. What will keep you coming back to them is how light and airy and similar to a regular bread bun they are! These hamburger buns are Keto. While I’m not a huge fan of the diet itself, the recipes typically use ingredients rich in healthy fats with a dose of protein — which are great for lowering the total carb load of anyone’s diet, and for replacing grains with more nutrient dense foods. I wanted to give a “whole grain” feel to my gluten free hamburger buns. To keep them paleo and keto, I added a touch of honey, and some ground up pumpkin seeds. Most gluten free bread recipes I’ve tried in the past have been too crumbly, and often required too many starches or weird ingredients I didn’t want to use. This healthy keto bread is made with 3 main ingredients — almond flour, psyllium husk, and egg whites. Combined with vinegar and baking powder, the three ingredients make fluffy airy bread magic! Nothing dense or crumbly about this paleo bread. 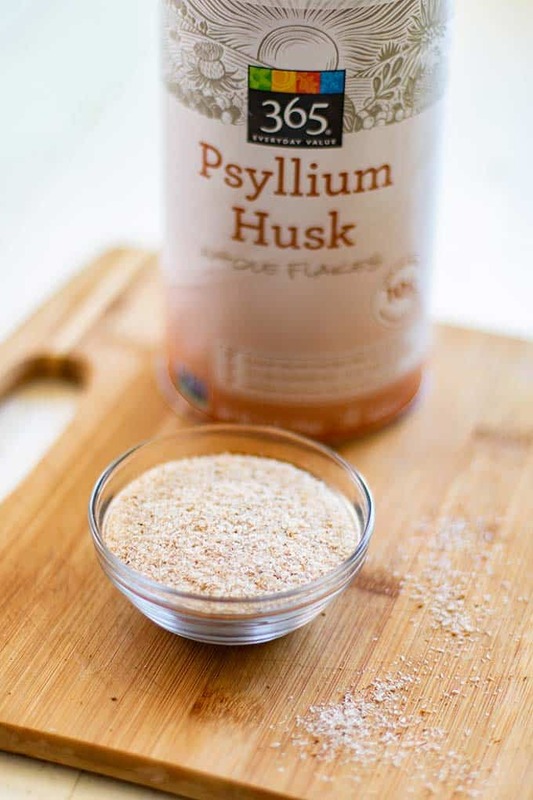 Psyllium husk is a totally natural plant fiber, and is becoming popular in gluten free baking because of it’s sticky holding power and it’s absorbency. The recipe calls for a lot of water, and as the water evaporates during baking, the bread is filled with little airy pockets, similar to a yeast bread — but no waiting for it to rise! This bread is stirred together and on a baking pan in 5 minutes flat. Rather than making bread with questionable ingredients like xanthan gum, a food additive that’s linked to digestive issues, psyllium husk has a range of positive health benefits, from aiding weight loss, to helping improve gut bacteria and lowering cholesterol. You can buy psyllium husk at Whole Foods in the supplement aisle. A large tub that will last many, many bread recipes costs $12. You can also buy i on Amazon. This recipe is incredibly easy. If you’ve made yeast breads in the past and know how much work kneeding (and waiting) it is, you will love the simplicity of this bread recipe. All you do is add almond flour, psyllium husk, some ground up pumpkin seeds (optional), baking powder and sea salt to a bowl, and give it a stir. Then add hot water, egg whites, vinegar and honey. Stir in the bowl for 1-2 minutes, until some of the air is stirred out and the dough resembles a light and sticky dough. It will hold together in the center of your bowl, and it’s easily cut into 4 pieces. This recipe is the perfect size for 4 hamburger buns, but you could also split it into 6 pieces and make small dinner rolls. They bake low, at 350, for 50 minutes. They will turn a deep brown color on the outside, but don’t be tempted to cut the cooking time down. The dough is very watery and the long baking time allows the water to evaporate. Make Extra Paleo Bread and Freeze it! Once you’ve tried this healthier gluten free bread, you’ll be hooked! It’s great stored in the refrigerator for about 4 days. The recipe is easily doubled. When you first bake them, they have a crunchy exterior. Similar to wheat bread, the exterior softens after it’s been refrigerated. The inside of this bread is more moist than regular bread, but I don’t mind that at all, and love to spread these with sunflower butter and top with fresh fruit. I’ve also baked them into croutons! I am thinking a summery gluten free panzanella is in the making soon! These toast great, and you can put them right on the grill next to your burgers as you’re bbq’ing. Add these to your meal prep routine! 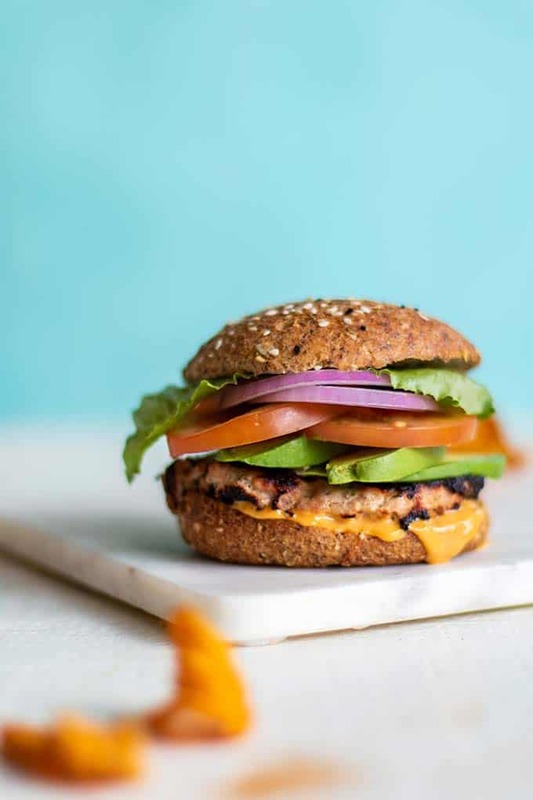 Not only do they taste way better than store bought gluten free hamburger buns, they are much, much healthier. Pictured above, I used these buns for turkey burgers. I added avocado, tomato, lettuce, and pickles, which is my perfect burger. Feel free to dress yours up with cheese, sautéed mushrooms or caramelized onions! Dinner rolls or “sliders”: Try splitting the dough into 6 instead of 4 large buns. Breakfast Sandwiches: Just add an egg, some sausage or bacon, and some avocado and egg, for a healthy and satisfying breakfast option! I also love them with nut butter and fresh fruit. 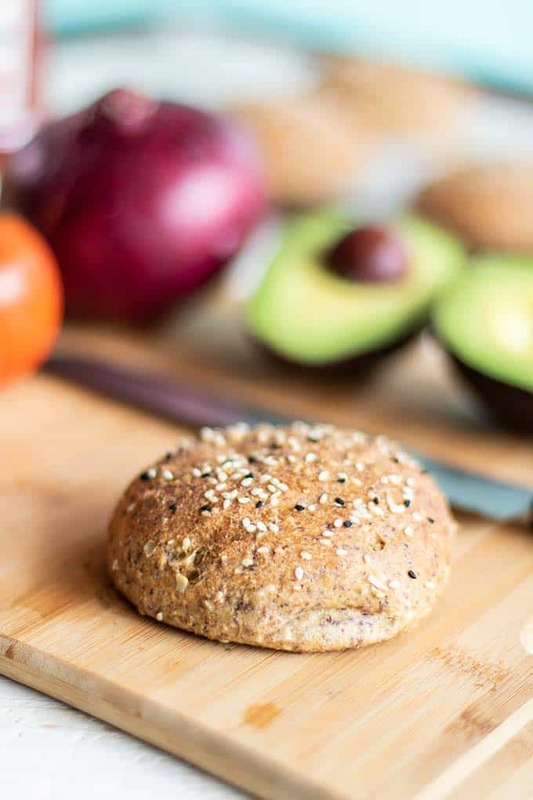 A healthy and very easy bread recipe, that makes perfect "whole grain" style buns. 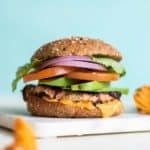 These hamburger buns are paleo and keto friendly, and very versatile. Once you've tried these, you'll be hooked! 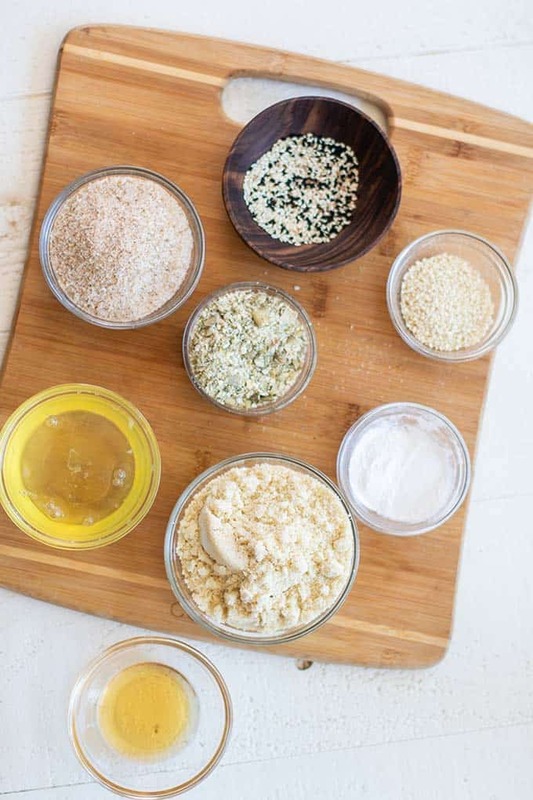 Combine almond flour, psyllium husks, pumpkin seeds, sesame seeds, baking powder and sea salt in a bowl. Add the liquid ingredients into the bowl quickly, and begin stirring. 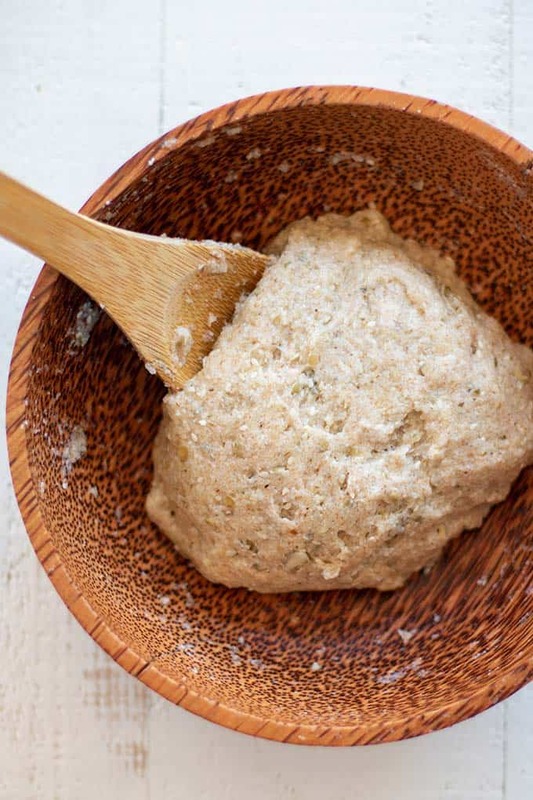 The dough will initially look very sticky, but continue stirring for 1-2 minutes, and the dough will thicken as the psyllium husk absorbs the water. Without over mixing, stop when the dough holds together in a ball and resembles a sticky dough. Cut the dough into 4 equal pieces, and use wet hands to mold in to a ball. Gently flatten onto a baking tray to the width of your desired bun. They will rise more as they bake. Bake buns for 45-55 minutes. The buns will get very dark on the outside, but resist removing them too early. The water needs a lot of time to evaporate, leaving a soft and light bread inside. The end result has a very similar texture to regular bread, but is slightly wetting. I don't mind the texture, but toasting the buns helps to dry it out. Store leftover in the refrigerator for 4 days, or freeze in airtight packaging for 2-3 months. Thaw and toast to serve. This gluten free hamburger buns post may contain affiliate links, meaning if you make a purchase, I will receive part of the sale as a commission. This helps me continue to bring you lots of fresh and inspired recipes! Is there anything I can replace for the egg whites? I am vegan. I am really not sure! I have never tried this recipe any other way -- if you try it, please let me know! :) Good luck. Hi Michelle, I tried this recipe but replaced the eggs with the aquafaba from a tin of chickpeas, it worked out great! Thank you Alex! I will have to try that! I haven't tested them with the powder, but honestly, I can't imagine why it wouldn't work. I need to go in and update this post -- some people have told me theirs turns out a little gummy inside. I've tried it a few times and have found that the reason that happens is if your oven isn't the right temp. So when you think they are done, cut one open, and if it isn't light and fluffy inside (it should be! ), just continue to bake another 10-20 minutes. Enjoy these! I am making them this weekend.